Be aware of the rules. Campsites often have rules for guests, so make sure you check those before you send out invitations. Figure out how many people you can host and where they will park. Prep them ahead of time of any rules they will need to follow while they are at the campsite or RV park. If you are parked at someone’s house, make sure to be clear on no-go zones for guests. Be prepared for people’s arrival. Given the tight quarters, it’s best if you aren’t cooking while guests are arriving. Have your food ready to go (finger food is best – you don’t want to have to worry about plates and silverware) and the drinks organized. Make use of hidden storage areas and clean out a closet for guests to put their coats and purses (and shoes, if you so desire). Clear out as much clutter as possible to make the area more spacious. When you don’t have a lot of room, the last thing you want to do is clutter up available surfaces with decorations. Hang festive lights around the room and maybe some fun snowflakes or ornaments in the windows. Wear a Christmas-themed sweater (the uglier, the better). Use decorative platters and glasses to serve your guests. Put your favourite Christmas music on the stereo, and your most beloved classics on mute on the TV. Anything that is multi-functional or out-of-the-way is best. Whether it’s a winter wonderland outside, or a balmy beach scene, many people in a small space is a recipe for an unintentional sweat box. Sure, have blankets or sweaters handy if it is cold, and don’t be afraid of the fireplace. But if it starts to get warm, crack a window, open the door, or turn on a fan to keep things from becoming unbearably stuffy. We’ve all been to a party where everyone clumps together around the food and drinks and it becomes a nightmare to move around. In an RV, these issues are going to be even more pronounced. You can solve this by putting food and drinks in various places around the RV. Fill the sink with ice for beers. Put the wine in the dining area. Have a cocktail station in the bedroom. And put plates and bowls of food throughout (though maybe not in the bathroom!) If there are going to be kids at the party, create a special space for them in the master bedroom. Spreading partiers throughout the space will help prevent it from feeling too cramped. 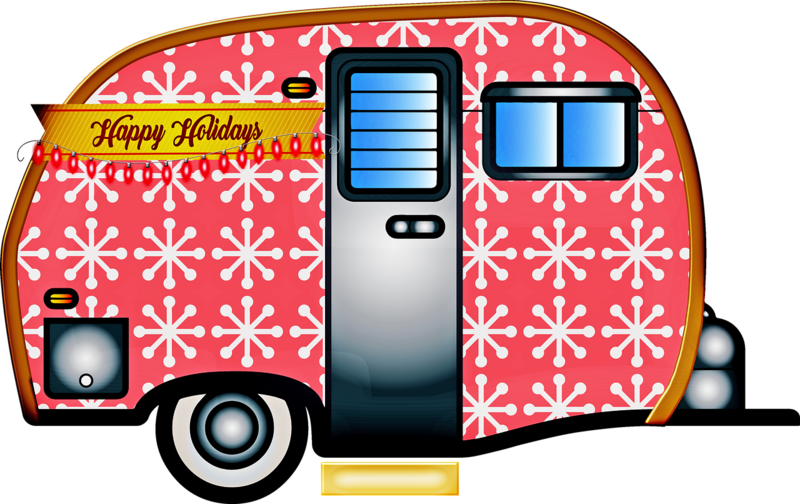 Weather permitting, using the outdoor space will be part of the appeal for an RV holiday party. Build a fire. Set out the makings for s’mores. Have an acoustic guitar handy if Christmas carol singing is your jam. String lights around the awning and add some festive touches to the outside. If it’s chilly, put a basket of blankets by the door. Add additional tables and chairs and bring out some of the food and drinks. Set up fun lawn games. Make your outdoor space an extension of the party. Party people don’t stop being party people when they are living in a small space. If you want to throw a holiday party, you throw the best party your space can handle. And then send us an invite!